When it comes to claiming and optimizing your Google My Business listing to get more leads, consider this a low hanging fruit. If you’re willing to spend several hours setting up your listing, then your work can pay dividends in the form of free leads. This guide will show you how. 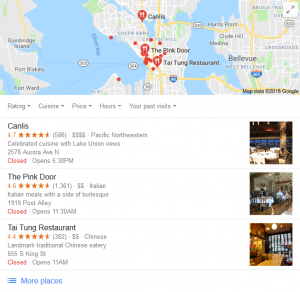 Google My Business (or GMB for short) is a service business owners like you can use to create a listing for your business so that it is displayed on Google Search and Google Maps. A GMB listing displays all kinds of useful information about itself to potential customers and searchers. 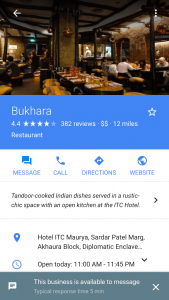 You can see a business’ address, get their phone number, see reviews, get directions and more. This is a list Google shows when you search for restaurants. You’ll get similar looking results if you search for other kinds of businesses like barber shops, bookstores, malls etc. 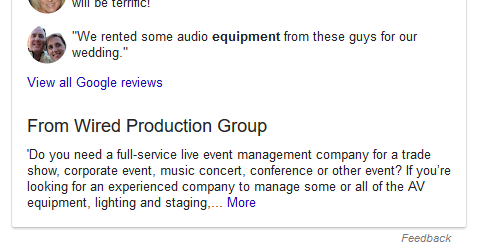 This is what we call a business listing on Google, created using a service called ‘Google My Business’ (GMB). Because millions of people search for local businesses on Google every day, it’s a FREE way of doing advertisement. Creating your own listing on GMB is easy. But there are many customizations you can make, which can make the process overwhelming. I’m going to show how to take full advantage of GMB and use its many features to create an optimized listing for your business so you can get the phones ringing. Before we get into the GMB optimization, let’s quickly overview how you can create your Google My Business profile. On the upper right corner where it says, Start Now, click on that and log in with your existing Google account. The credentials is the same as your Gmail account. Note that the Google account you’re logging into is the one that will be associated with your GMB profile. So if you have multiple Google Accounts, choose carefully. Enter your company name along with the address. Quick Tip: Ensure NAP Consistency. NAP is an acronym for Name, Address, and Phone number. You want to make sure the NAP for your GMB listing is consistent across the profiles you have across the internet such as your Facebook page, website, Yelp, and others. Lack of NAP consistency can hurt your SEO because the search engines become confused when they find themselves indexing inconsistent NAPs across the internet. Quick Tip: Put your business into multiple relevant categories. If you’re a landscaping and lawn care company, you add the following categories: landscaper, lawn care services, landscape designer, tree service. Leveraging multiple categories increases the chances of your listing being shown more as the category can trigger a user’s search results. Verify your business. Google gives you multiple verification methods including postcard, phone, email, and instant verification. If you’re not ready to verify yet, you can skip this step and come back to it later. Business Descriptions is a GMB feature that allows you to tell people what your business is all about. Here, you get 750 words to introduce your business, tell what services or products it offers, what makes it unique, its history and similar information. This section isn’t meant for advertising or promotion (that’s what Google Posts are for which we’ll discuss below). It’s merely a place for you to tell people why they should visit your business. Quick Tip: Even though your business description can be up to 750 words, make sure you offer compelling reasons why people should visit your business within the first 250 words. Because after the first 250 words, the rest of the description gets cut off – and lazy people (the majority) won’t read the rest! Insights has to be the most interesting feature on Google My Business (GMB). Because it gives you a wealth of data regarding how your listing is performing. And who doesn’t love data? addition, you can also see how many people are searching for you on Google Maps vs Google Search. What Actions They Take: After they find your listing, Insights can show how many people called you, went to your website, looked through your photos, etc. Where They Are Coming From: This is a useful data point which will show you from which areas of the city your customers are coming from. By understanding the geographic makeup of your visitors, you can optimize your website for specific cities or subdivisions to improve your SEO. The data from Insights is based on from where people request directions to your business. And that’s just the start. GMB Insights has a ton of smart data about your SMB listing you can use to further optimize your photos, description, posts and more. For example, Google’s rolling out a new data point which shows you what keywords people are typing to find your business. This will be a goldmine of information, especially useful if you’re thinking of creating an SEO optimized website. In addition to phone calls, customers can message you directly as using your GMB listing thanks to the new messaging feature. Enable ‘messaging’ from your GMB dashboard. Many people don’t like talking on the phone and prefer the convenience of messaging which is why this feature is a welcome addition. But like some other features in here, it’s only available in certain countries only. There’s a Q&A section on GMB listings that you shouldn’t ignore. 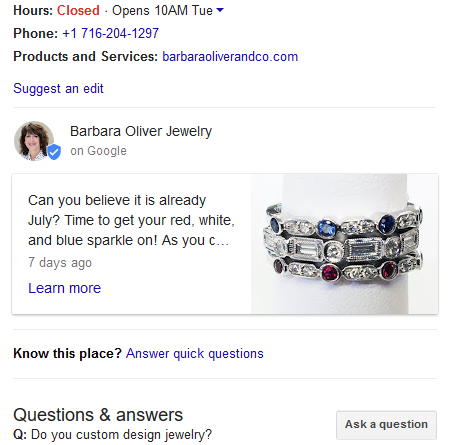 Using Google Search and Maps, anyone can ask a question about your business, and similarly, anyone can answer that question. That’s why it’s important you regularly check your GMB listing for any new questions and answer them before someone else does to avoid the possibility of incorrect information showing up on your GMB listing. Unfortunately, there’s only one way to get notified of any new questions on your listing, and that’s by installing the Google Maps app on your Android Phone and turning on notifications (sorry, iOS users). If you don’t have an Android, then it’s your job to manually check your listing and answer any new questions that might appear. You can now upload videos related to your business in addition to pictures on your GMB listing. Videos are more accurate in showing what your business looks like to potential customers. It’s worth noting that your customers will be able to upload videos of your business as well. But don’t worry, you can flag videos that are inappropriate and get them removed. The reason why you should add videos to your GMB listing is because it’s the easiest way to stand out. A small percentage of businesses are aware of this feature, which means if someone scrolls through your photos and sees a video, you’ll leave a lasting impression. Other than that, videos will influence your customers to know more about your business as well – and increase chances they will visit it. 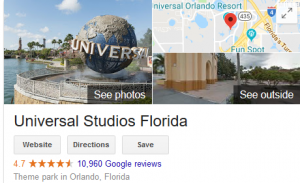 The photo gallery is probably the most visited section of your GMB listing. People will view pictures of your business to help decide if they want to shop or do business with you. Profile Picture: This is the most important picture of your business. Your profile picture will be shown as the first picture on Google Search, Google Maps, in the suggestions bar next to your competitors and more. Cover Photo: This picture will be shown as the cover on your Google+ profile and also alongside your business’ profile picture. Additional Photos: These can be any pictures related to your business such as interior, exterior, products, atmosphere and more. Google has a handy chart you can use as a guideline as to what kind of images to take related to your business. According to Google, businesses that add new photos on their GMB listing get 35% more clicks to their websites and 42% more requests for directions to their location. And this leads to more customers! To get reviews, you just have to ask your customers. But do it ethically. Don’t bribe customers for 5-star reviews in exchange for money, discounts or free products and services. And any time someone leaves a review, be sure to respond. 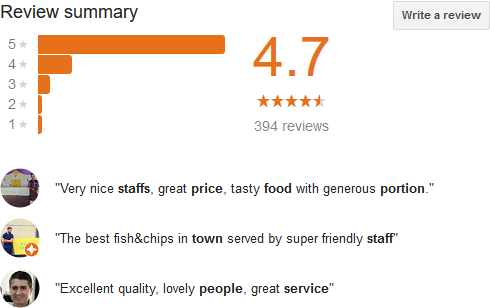 This leaves a good impression to potential customers and it encourages more to review you. It’s important to realize that the review section isn’t something you can directly control. Just provide your customers will stellar services and this section will take care of itself. This feature was previously only limited to restaurants. But thankfully, the Google gods realized other businesses provide services as well. 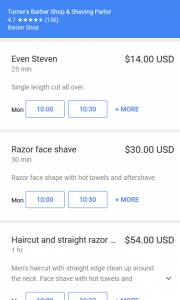 Now businesses like barber shops, florists, and even digital agencies can use the service menu feature to list their own services along with the relevant price tag. You can also divide your service menu into sections if you offer an extensive range of services. These sections can then house their own services so customers can more easily find what they’re looking for. If your business focuses primarily on providing services – and require people to book appointments with you, you’ll love this feature. drive customers to your company. All you have to do is go to your GMB dashboard and click on ‘Accept Bookings on Google’ option. Then you sign up for one of Google’s partner booking services. And that’s it. After doing this, you’ll see a blue button on your listing. Anyone who comes across your business will be able to directly book your services online. And you’ll get a dashboard through which you can track your revenue. It’s a must-have feature for any service-based business, especially those in the beauty and fitness industry. This feature is available in the US and will be expanding to other countries. Only Google knows when. Google Posts are mini advertisements for your business. You can create posts to show off new products and services, promote special offers or to announce new events. Create new posts frequently as Google Posts expire after 7 days. Frequently posting on your GMB listing is totally worth the effort. That’s because they improve your ranking on Google Search and Maps. 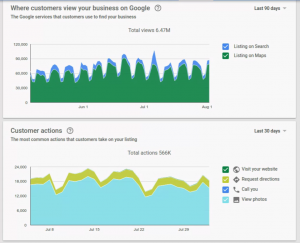 New posts send a signal to Google that you’re an active business because of the fresh content. And when search engines crawl through your new content regularly, it improves your rankings on Google Search and Google Maps. But before you get started, if you haven’t already, follow the instructions in this support article and claim your GMB listing for your business if you haven’t already. 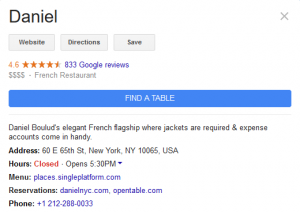 Then use the information in this article to optimize your Google My Business listing. It’s important you do that because in today’s age, people increasingly use Google to search for local brands. According to research, 70% of people who search for a local business go visit a store within the same day. That’s why maintaining your online presence matters. And besides, services like GMB is a free way for you to get new customers and insights about your business. 2019 Comparison Review: HomeAdvisor vs Angie’s List vs Thumbtack vs Porch.